The military decision making process (MDMP) is an iterative planning methodology to understand the situation and mission develop a course of action, and produce an operation plan or order. The military decision making process helps leaders apply thoroughness, clarity, sound judgment, logic, and professional knowledge to understand situations, develop options to solve problems, and reach decisions. This process helps commanders, staffs, and others think critically and creatively while planning. The MDMP facilitates collaborative planning. The higher headquarters solicits input and continuously shares information concerning future operations through planning meetings, warning orders, and other means. It shares information with subordinate and adjacent units, supporting and supported units, and other military and civilian partners. Commanders encourage active collaboration among all organizations affected by the pending operations to build a shared understanding of the situation, participate in course of action development and decision making, and resolve conflicts before publishing the plan or order. The MDMP also drives preparation. Since time is a factor in all operations, commanders and staffs conduct a time analysis early in the planning process. This analysis helps them determine what actions they need and when to begin those actions to ensure forces are ready and in position before execution. This may require the commander to direct subordinates to start necessary movements, conduct task organization changes, begin surveillance and reconnaissance operations, and execute other preparation activities before completing the plan. As the commander and staff conduct the MDMP, they direct the tasks in a series of warning orders (WARNOs). The MDMP consists of seven steps. Each step of the MDMP has various inputs, a method (step) to conduct, and outputs. The outputs lead to an increased understanding of the situation facilitating the next step of the MDMP. 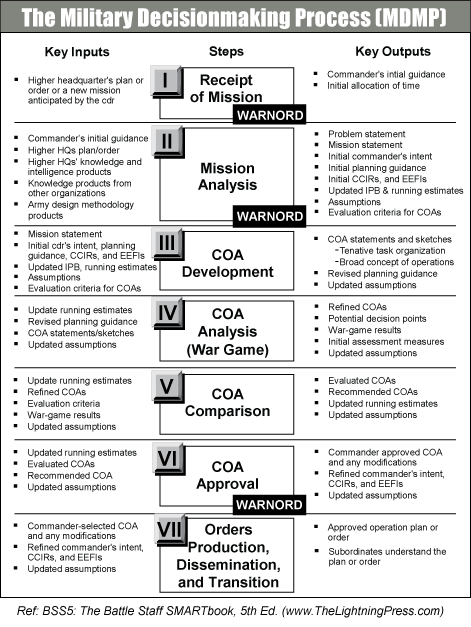 Commanders and staffs generally perform these steps sequentially; however, they may revisit several steps in an iterative fashion as they learn more about the situation before producing the plan or order. Commanders initiate the MDMP upon receipt of or in anticipation of a mission. Commanders and staffs often begin planning in the absence of a complete and approved higher headquarters’ operation plan (OPLAN) or operation order (OPORD). In these instances, the headquarters begins a new planning effort based on a WARNO and other directives, such as a planning order or an alert order from their higher headquarters. This requires active collaboration with the higher headquarters and parallel planning among echelons as the plan or order is developed. The MDMP can be as detailed as time, resources, experience, and the situation permit. Conducting all steps of the MDMP is detailed, deliberate, and time-consuming. Commanders use the full MDMP when they have enough planning time and staff support to thoroughly examine two or more COAs and develop a fully synchronized plan or order. This typically occurs when planning for an entirely new mission. Commanders may alter the steps of the MDMP to fit time-constrained circumstances and produce a satisfactory plan. In time-constrained conditions, commanders assess the situation, update the commander’s visualization, and direct the staff to perform the MDMP activities that support the required decisions. In extremely compressed situations, commanders rely on more intuitive decision making techniques, such as the rapid decision making and synchronization process. Depending on the situation—to include the familiarity of the problem—commanders conduct Army design methodology before, in parallel with, or after the MDMP. When faced with an unfamiliar problem or when developing initial plans for extended operations, commanders often initiate the Army design methodology before the MDMP. This sequence helps them better understand the operational environment, frame the problem, and develop an operational approach to guide more detailed planning. Commanders may also elect to conduct the Army design methodology in parallel with the MDMP. In this instance, members of the staff conduct mission analysis as the commander and other staff members engage in framing the operational environment and the problem. Knowledge products—such as results from intelligence preparation of the battlefield and running estimates—help inform the Army design methodology team about the operational environment. Commanders may direct some staff members to focus their mission analysis on certain areas. This focus helps commanders better understand aspects of the operational environment. The results of mission analysis (to include intelligence preparation of the battlefield and running estimates) inform commanders as they develop their operational approach that, in turn, facilitates course of action development during the MDMP. This article is an extract from “BSS5: The Battle Staff SMARTbook, 5th Ed. (Leading, Planning & Conducting Military Operations)” by The Lightning Press. Download a free PDF sample and learn more at: BSS5: The Battle Staff SMARTbook, 5th Ed. (Leading, Planning & Conducting Military Operations).